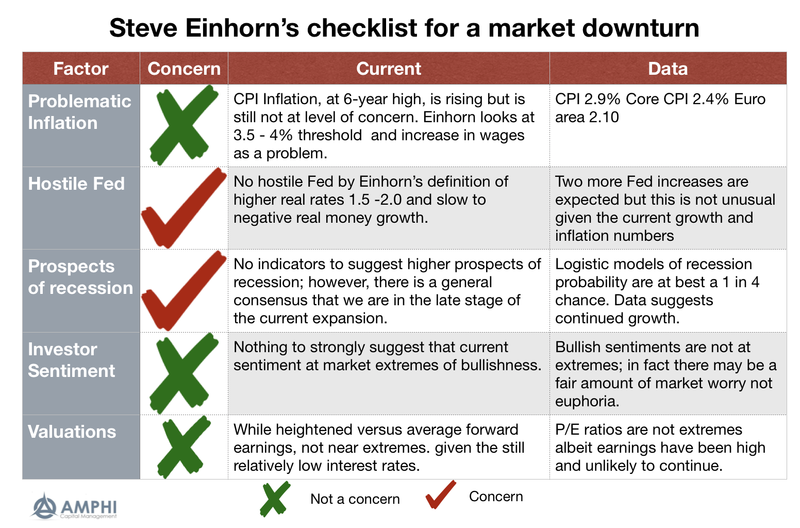 Recent interviews with Steve Einhorn, the long-time hedge fund manager, provides his checklist for when a bull market may turn into a bear market. It is not supposed to be a definitive forecast, but a good simple indication when conditions are ripe for a change. See Boyer Blog and Barron's . 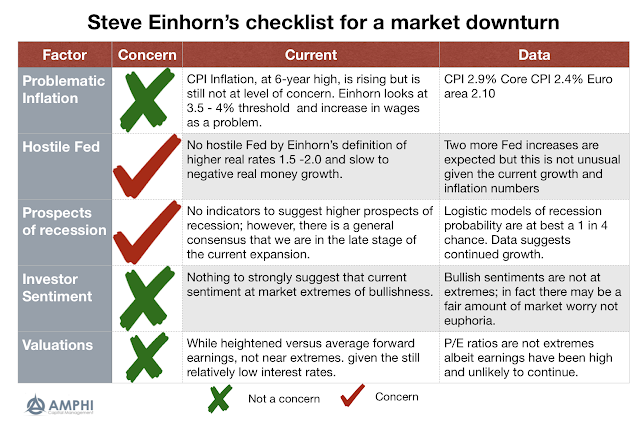 Einhorn's list of things to watch is not surprising, but it does provide a level of specificity that is often lacking from others. Market environment checklists are important because they define terms and provide details for when financial changes may occur. There will be surprises, but a bear market checklist sets the tone for any allocation discussion. They can be easily developed and checked on a regular basis. Inflation is not a problem albeit currently above the 2% target. The Fed is engaged in QT and raising rates, but their action is consistent with the currency US economy. We do have concerns on the impact of dollar shortages to the rest of the world. The prospects of a recession are low although many view that we are ion the late stages of the expansion and market cycle. Investor sentiment is not at extreme although we are watching closely the credit cycle. Valuations are not at extremes, but there should be concerns that forward earnings may not be able to maintain current high levels. Checklists can come in many forms: what are current conditions, what are potential excesses, or what are risks that have not been realized. A current market environment assessment does not appear stormy.